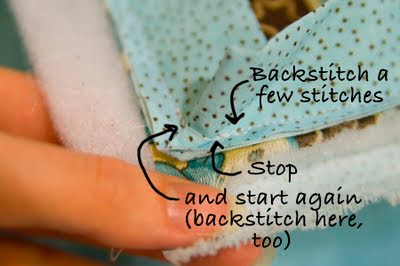 Here's a quick tutorial on another sewing basic: binding a quilt. Measure around your quilt. Add several inches (for seams and just to make sure you don't end up short!). Cut out enough 2 1/2 inch wide strips to add up to this measurement. If you are binding a quilt with curved edges, you will want to cut the binding on the bias (at a 45 degree angle) so it will have enough stretch to take the curves nicely. But if your quilt has straight edges, cutting from selvage to selvage is just fine, and more fabric-efficient. Note: All seams are 1/4 inch. 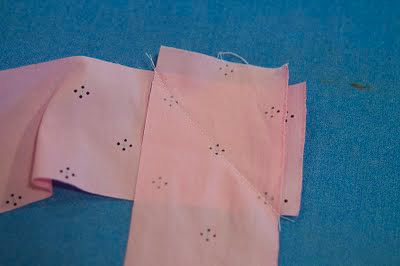 Sew your binding strips into together (right sides together) at a 45 degree angle. For some reason, the slanted seam line is less noticeable in the finished quilt. Notice that I overlapped the two strips with a 1/4 inch hanging off the sides? This is to make sure the edges match up properly when you open it up. Trim to 1/4 inch seam allowance, and iron open. Once all your strips are sewn together, fold your new long binding strip in half, lengthwise, wrong sides together. Iron it down nicely. I like to have the binding doubled like this to add durability to the finished quilt. Now pin your binding along the edge of your quilt, raw edges together. Sew it on, going through all the layers. I like to sew the binding onto the front of the quilt initially; I think the final quilt turns out nicer. But you could sew it onto the back if you'd rather. 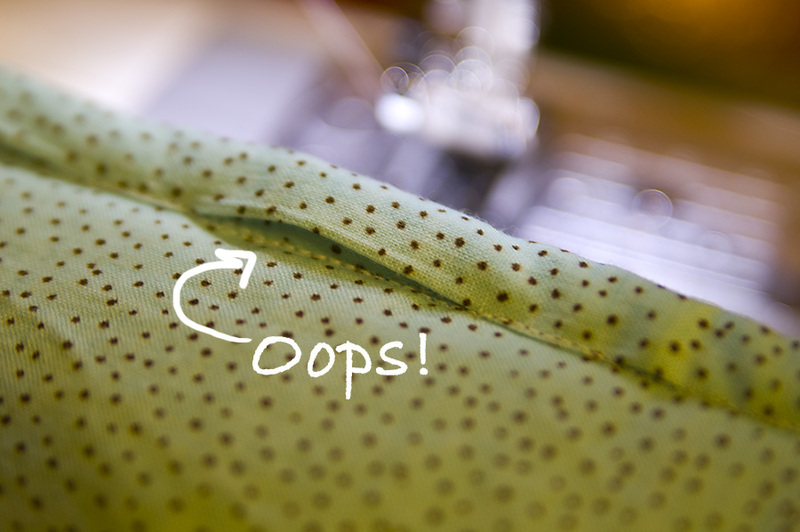 When you come close to a corner, backstitch a few stitches to reinforce the seam, then don't sew around the very tip of the corner. Start back again, backstitching, just after rounding the corner. 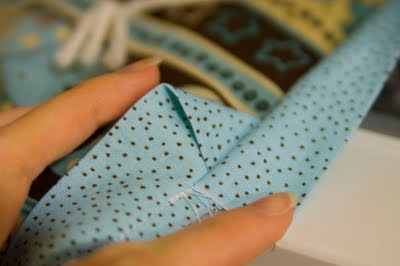 When you fold the binding around, arrange the fabric into a nice mitered corner. 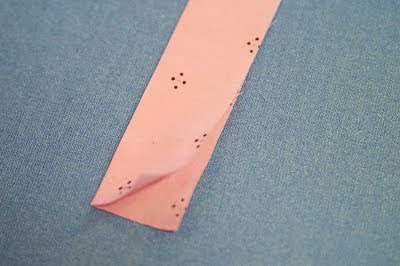 When you get back to where you started, fold back the corner of the binding strip (as pictured) to make a 45 degree angle. 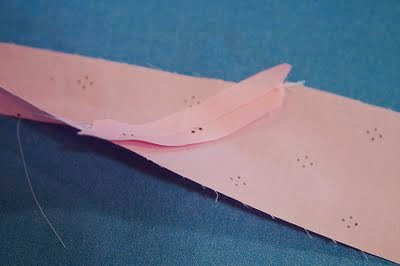 Make sure the end of the binding overlaps the corner you make by at least 1/4 inch. A little extra overlap wouldn't hurt anything. Now fold the binding around the edge of the quilt. Pin in place, making sure to cover the sewing line from the previous step. There are three ways to finish from here. Option One: You can use a straight stitch and sew (from the front, since that's the most important to look nice) as close as you can to the inside edge of the binding, as you want to catch the binding on the back. Oops! Need to go back and stitch that down by hand. 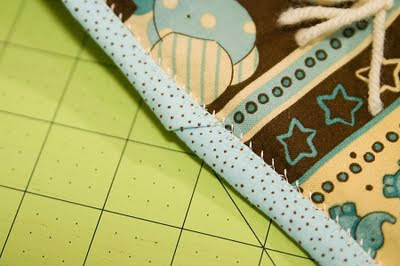 Option 2: You can use a decorative stitch and sew across the inside edge of the binding. 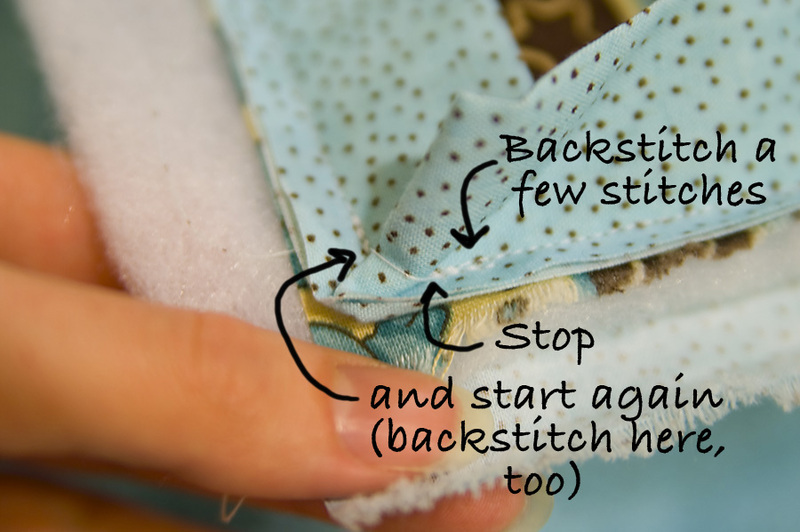 This method makes it a lot easier to always catch the binding on the back. And it looks nice, anyways. Option 3: You can sew the binding to the back of the quilt by hand. For a baby quilt, or any other quilt that will be washed often, I would recommend one of the machine-stitching methods of finishing (for greater durability). If the quilt will not be washed often, hand-stitching will work great. And now your quilt is finished!